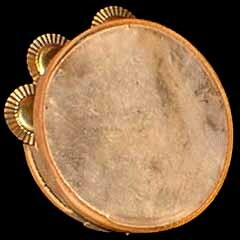 The Spanish tambourine, the pandereta, is usually 10-13 inches (25 cm-30 cm) in diameter, with usually a staggered row of jingles, and is held in the Traditional grip but there are many variations in size and jingles. In Galicia, the northwestern corner of Spain, the technique involves holding the pandereta (also spelled pandeireta) in the right hand while often keeping the left hand stationary (but some players do hold with the left and play with the right). In this manner, the right hand moves the pandereta around the left hand to execute a variety of duple and triple rhythms. The thumb and middle finger of the left hand are also used to articulate rhythms across the surface of the skin and the instrument can also be shaken and beaten much in the way a common tambourine is played. In Basque Country, northern Spain (just left of the border with France), a technique used for playing the pandereta (also spelled panderoa) involves bouncing the tips of the middle and/or ring fingers across the skin in alternation with the thumb for duple rhythms with the right hand (if the instrument is held with the left but some players do hold with the left and play with the right). This panderoa is also played in the French Basque Country of southern France in Gascony. In Asturias, northern Spain just next to Galicia, and Cantabria (next to Basque Country), the pandereta is used in annual festivals of folk music. The pandereta from Asturias and Cantabria usually have smaller jingles than those found on pandereta in Basque Country and Galicia. In southern Spain there are two additional tambourine traditions. One in Málaga, where the tambourine is called pandero, involves a very large drum with an excessive amount of jingles and different playing techniques. The pandero is used in ensembles called panda de Verdiales during annual festivities in late-December that feature Verdailes Flamenco music. In Seville, there is an old tradition of university student ensembles known as tuna that perform music and a dance in which a performer strikes a small pandereta while dancing. The tuna ensembles date back to the 1700s and are also found today in many parts of Latin America such as Mexico, Peru, Chile, Venezuela, and Colombia. 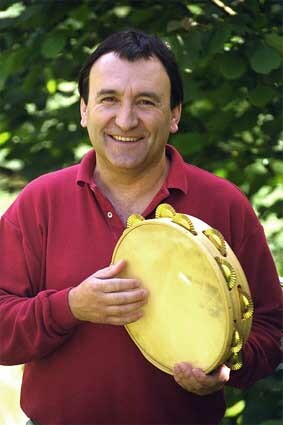 The terms pandeiro and pandeireta may be used generically in either Spain or Portugal indicating tambourine. 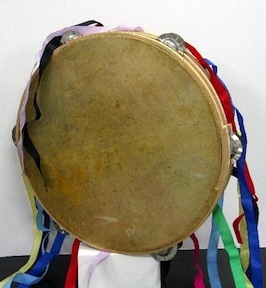 Basque terms for tambourine also include panderoa and pandero. 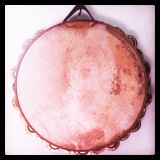 The Galician term is pandeireta and also pandera (with pandeira referring to a large tambourine). 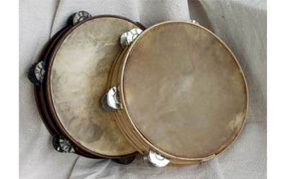 Pandereta is the common term for tambourine used in Asturias. Terminology can be confusing for non-natives. Different terms and spellings are often based in regional (and historical) differences, the size of a particular drum, and feminine vs. masculine language practice. Xabier Berazaluze, also known as "Leturia," is one of the most refined players of panderoa from the Basque Country in Spain and has been recording on the instrument since 1986 primarily with Tapia eta Leturia. Anerlis Gonzalez is pandereta player from Asturias who records with Xuacu Amieva. Alba Gutiérrez is a pandereta player from Cantabria. The top photo is a pandeireta from Galicia. The photo below is of pandereta from Asturias. The middle photo is the great Basque panderoa player Xabier Berazaluze "Leturia." Below that is a photo of a tuna pandereta from Sevilla, Spain. The bottom photo is of a pandero from Málaga, Spain. A Galician pandeireta player is Mercedes Peón. This sound sample is by the Basque group Oskorri with Natxo de Felipe on panderoa.